The Monk Dometius lived during the Fourth Century, and he was by birth a Persian. In his youthful years he was converted to the faith by a Christian named Uaros. Forsaking Persia, he withdrew to the frontier-city of Niziba (in Mesopotamia), where he accepted Baptism in one of the monasteries and was tonsured into monasticism. But then fleeing the ill-will of the monastery inhabitants, the Monk Dometius moved on to the monastery of Saints Sergius and Bacchus in the city of Theodosiopolis. The monastery was under the guidance of an archimandrite named Nurbelos – a strict ascetic, about whom it was reported, that over the course of 60 years he did not taste of cooked food, nor did he lay down for sleep, but rather took his rest standing up, supporting himself upon his staff. In this monastery the Monk Dometius was ordained to the dignity of deacon, but when the archimandrite decided to have him made a presbyter, the saint in reckoning himself unworthy hid himself away on a desolate mountain in Syria, in the region of Cyr. Reports about him constantly spread about among the surrounding inhabitants. They began to come to him for healing and for help. Many a pagan was brought to the faith in Christ by Dometius. And one time, in the locality where Saint Dometius asceticised with his disciples, the emperor Julian the Apostate (361-363) arrived, journeying along on his campaign against the Persians. 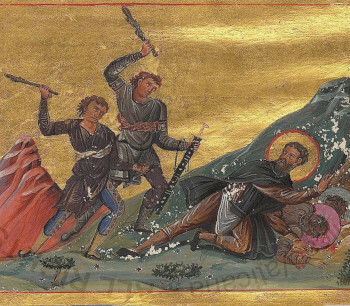 By order of the emperor, soldiers searched out Saint Dometius praying with his disciples in a cave, and stoned them to death (+ 363).